Seattle architect Jesse Milton Warren was born in San Francisco on December 14, 1888. While his formal training is unknown, some reports indicate he received architectural training in New York before returning to San Francisco to gain practical experience as a draftsman. While there he worked for a variety of Bay area firms including Bliss & Faville, Stone & Smith, Oliver & Foulkes, William Curlett & Son, and architect E.J. Vogel. With experience in hand, Warren traveled through eastern Canada and the Unites States eventually arriving in Seattle around 1910. Reportedly he was employed by the Beezer Brothers and the architectural firm of Thompson & Thompson before forming a short-lived partnership with architect William P. White in 1911. No known projects from the firm of White & Warren have been identified to date. Most likely due to the urging of his brother, Warren then moved to Victoria, B.C. in 1912. During his time in Victoria, he designed a number of high profile buildings and several residences ranging in size from small Craftsman Bungalows to large, substantial homes for the wealthy. Among his known projects are a factory building for the Canada Mosaic Tile Co. (1912); the Central Building (1913); the Station Hotel (1913); the Pantages Theater (1914); and the Sands Funeral Home (1915). While in Canada, Jesse and his brother, George, were active promoters of Victoria. Both were founding members of the Victoria B.C. Rotary Club and George served as Commissioner of the Victoria and Island Publicity Bureau for over 40 years. For reasons unknown Jesse moved to Butte, Montana around 1916. With offices in the Daily Bank Building, he designed a 3-story hotel for the Ben Bank Realty Company (1917); and completed plans for the First National Bank (1918) in Marmarth, South Dakota. By 1919 Warren was back in Seattle with an apparent change in careers, forming his own real estate company; the Warren Realty Company. Quickly rising as a young star among the real estate community, Warren was elected as first Vice President of the Seattle Real Estate Association in 1923, and served as President of the Seattle Gyro Club. By May of 1923, he was appointed sales manager of Gardner J. Gwinn Inc.; one of Seattle’s largest a real estate investment and construction firms. While holding that position for four years, Warren was activity involved in residential construction and promotion throughout the greater Seattle area. He served a chairman for the 1925 “Own Your Home Exposition”, and was president of the Wallingford Commercial Club. Despite his new career, Warren kept his interest in architecture, and in fact received his state architectural license (No. L57) by reciprocity in 1925. The following year, Warren left Gardner Gwinn and reorganized his own real estate firm into a new firm named: Warren, McKernan & Evers. Partners J.W. McKernan and Volney P. Evers, helped Warren open the new business with a capitol stock of $15,000. The firm focused on projects in the University District. Remaining an active proponent of real estate, Warren represented the State of Washington in the “Home Town” oratorical contest at the National Association of Real Estate Boards convention in Tulsa, Oklahoma in 1926 (one of 20 selected nation-wide), and was heavily involved in the Seattle Real Estate Association. By the mid 1930’s Warren’s partners had moved on and the company was renamed back to the Warren Realty Company. Then in 1937 he formed a new partnership with the Hart Real Estate Company; renaming the business: Warren-MacDonald & Co.
Warren’s return to the architectural profession is marked by a store design he produced for the Hillman Investment Company at 1027-1035 E 65th Street in 1938. Later that year he became business manager for the company. He also designed two small spec houses for Norman Cline (3067 & 3069 63rd Ave S.) in West Seattle (1940). After the WWII, Warren architectural practice was focused on small efficient homes. Projects include a small minimal traditional style home featured in Pacific Northwest Book of Homes (1947); a simple concrete block ”economy model house” for the 1949 Home Show (4740 34th Ave NE), and several speculative houses for A. J. Mullay (1949-50). Many of his projects took on Art Deco and Streamlined Moderne characteristics including the Whitworth House (1947-52); Standard Radio (1947); Wedgewood Estates Apartment complex (1948); and the Dean Court Apartments (1950). Warren retired to Santa Barbara, California in 1952 and died there on September 1, 1953. Marriage Certificate – Jesse M. Warren – No. 26256, January 25, 1910. “Victoria Will Send Delegates and Alternatives to Convention” The Rotarian – July 1915. “Spencer Heads Seattle Real Estate Association” Seattle Daily Times – January 12, 1923, pg 10. “Gyro Musicians Make Call” Seattle Daily Times – February 18, 1923, pg 11. “Eastern Building Heavy: Jesse M. Warren Sees Bigger Construction Year Than Last” Seattle Daily Times – March 4, 1923, pg 26. 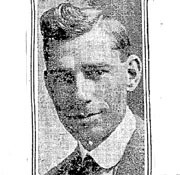 “Directs Gwinn Sales: Jesse M. Warren Named Department Manager” Seattle Daily Times – May 7, 1923, pg 18. “Exposition to Encourage Building of Real Homes” Seattle Daily Times – May 3, 1925, pg 29. “Own Your Home Exposition Makes Successful Start” Seattle Daily Times – April 5, 1925, pg 70. “Exposition At Armory” Seattle Daily Times – June 24, 1925, pg 18. “Fine Home District: Wallingford Hill Popular for Residences” Seattle Daily Times – June 25, 1925, pg 16. “Two Architects to Get Licenses” Seattle Daily Times – July 10, 1925, pg 3. “New Incorporations” Seattle Daily Times – January 16, 1926, pg 14. “New Realty Firm Launched: Will Operate in North End” Seattle Daily Times – February 7, 1926, pg 29. “J.M. Warren to Seek Oratorical Honors at Tulsa” Seattle Daily Times – May 30, 1926, pg 19. “Listing Bureau May Expand Its Service” Seattle Daily Times – October 2, 1927, pg 27. “Multiple Listing Bureau Members To Hold Session” Seattle Daily Times – April 27, 1930, pg 15. “Cora Sterling Inadvertently Goes Golfing” Seattle Daily Times – October 6, 1933, pg 5. “Warren, Evers In Lloyd Bldg.” Seattle Daily Times – March 11, 1934, pg 26. “Realty Board Team Out After Members” Seattle Daily Times – April 14, 1935, pg 24. “Jesse M. Warren, President of the Warren Realty Company…” Seattle Daily Times – May 24, 1935, pg 31. “Jesse M. Warren New President of Realty Firm” Seattle Daily Times – January 31, 1937, pg 40. “U District Company In New Offices” Seattle Daily Times – June 27, 1937, pg 22. “New Structures To Cost $84,400” Seattle Daily Times – February 10, 1938, pg 24. “John Miller Named to Realtor Board” Seattle Daily Times – June 19, 1938, pg 23. “Building Permits” Seattle Daily Times – December 4, 1940, pg 23. “Economically Built and Heated” Pacific Northwest Book of Homes – 1947. “Economy-House Project Has 12 Teams at Work” Seattle Daily Times – April 17, 1949, pg 5. “Economy House” Seattle Daily Times – July 17, 1949. “Seattle Open House-House Display Will Feature National Home Week” Seattle Daily Times – September 4, 1949.